The demand for access to email anytime, anywhere, and from any device has made it critical for IT departments to ensure their Microsoft Exchange deployments are secure, fast, and available. But email services delivered over the Internet can be vulnerable since traditional firewalls allow encrypted traffic to pass through open ports without inspecting those payloads. The challenge lies in enforcing security measures before traffic reaches the internal network. 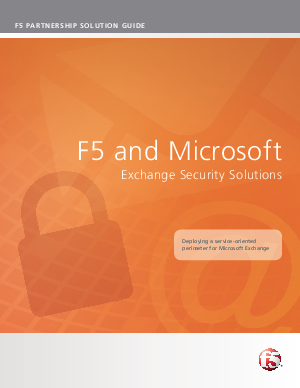 Extending your security perimeter outward can improve security and availability for Microsoft Exchange email services published over the Internet, including Outlook Web App, Exchange ActiveSync, Outlook Anywhere, and Exchange Web Services. This Microsoft Exchange Security Solutions Guide explains how an Application Delivery Controller can prevent potentially malicious traffic from ever reaching Exchange by extending your security perimeter.